The Hollywood Christmas Parade brings Santa to town on Sunday 11/28/2010 The Hollywood Christmas Parade has been an American tradition for more than eighty years! This year, the parade benefits Marine Toys for Tots and take place the Sunday after Thanksgiving at 6pm. The 2010 Grand Marshall of The 2010 will be Larry King (CNN’s Larry King Live). Ok, it’s not the Macy’s Thanksgiving Parade or Pasadena’s Rose Parade but The Hollywood Christmas Parade is our own local festive event complete with a ton of celebrities, marching bands, floats, equestrians, giant balloons and general merriment. I’ve always enjoyed this parade from the curb- walking alongside and following the bands (my favorite part)! You can come early and plant yourself on the curb. Curbside seating is FREE and available all along the parade route starting east of the Grandstand Seating area on Hollywood Boulevard. The Hollywood Parade begins at Hollywood Blvd and Orange, travels east to Vine, south on Vine to Sunset Boulevard and west on Sunset, back to Orange. If you’d like to reserve a seat, grandstand tickets for the 2010 Hollywood Christmas Parade are now available for purchase within Associated Television International’s “live set” area located on Hollywood Boulevard between Orange Street and Highland Avenue. Tickets are $35 per ticket and seats are reserved at the time the order is placed. Tickets can also be purchased by phone until the afternoon of November 27 by calling 866-727-2331. There are parking lots throughout Hollywood including the Hollywood & Highland Shopping Complex. If you want to avoid the traffic hassle and go green, why not take the Metro? The closest Metro Stations are at Hollywood and Highland and the station at Hollywood and Vine. Use the Metro Trip Planner at www.metro.net to help you determine your best route. 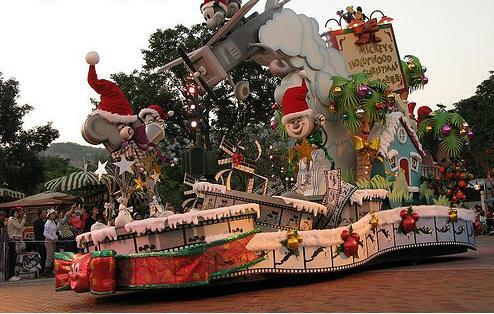 For further information about The 2010 Hollywood Christmas Parade Benefiting Marine Toys for Tots, please visit the parade’s official website or call 1-866-PARADE1 (1-866-727-2331).